Police are searching for three suspects who were caught on video robbing a Texas doughnut shop and giving out free pastries to customers inside the store. Houston Police Department's Robbery Division released surveillance video Tuesday of the robbery at Shipley's in North Houston. Video shows three suspects enter the doughnut shop around just before 3 p.m. Monday. One of the supects is holding a handgun and jumps the counter demanding money from the cash register. Another suspect also jumps the counter while the third male approaches two customers inside the shop and takes their cellphones. "During the robbery, the male that took the customers cellphones jumped over the counter and offered them doughnuts while the other two suspects were robbing the employees," Houston Police said. 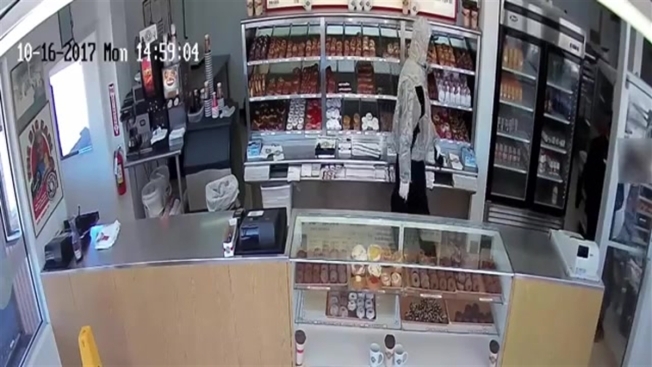 Surveillance footage shows him handing out doughnuts to the customers as the three suspects are leaving the shop. All three men are wanted on charges of aggravated robbery with a deadly weapon, the police said.